Order Today directly from one of our Sales Team members. Call (877) 627-0636 or (603) 627-8728 or REQUEST A QUOTE! Traditional POS systems have sacrificed simplicity for an over abundance of features. By adding unnecessary features, they’ve made running a POS more and more difficult, time consuming and stressful for you. To combat such hassles, we’ve created Ambur, a beautifully simple system. We’ll be your righthand man, helping to set up your menu, your wireless network and all other features of Ambur. After a couple weeks, you'll feel like a master. Organize staff, permissions, and payroll by creating User Groups for employees with different responsibilities. Just define pay rates and taxes, and Ambur will automatically calculate employee payroll from clock-in/clock-out data. Add, edit, or delete menu items right on your iPad at anytime. Organize them into categories for faster ordering. 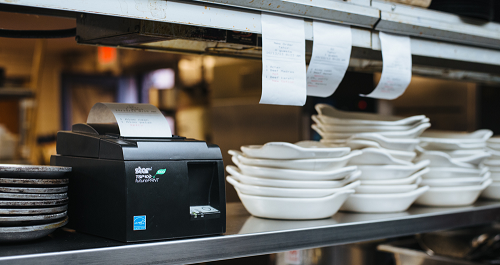 Print orders to the appropriate kitchen printer, and customer receipts to the register. Right from your iPad. Use any thermal impact printer to wirelessly print to any location - no more wasted time running back and forth. Ambur's most valuable functions. Understand your business better with data on all aspects. View, email, or export to CSV. Save time and avoid confusion with seamless order-taking. You can see your order, add items, and take payments. All from a single screen. Assign order types and relevant customer information to any order for quicker turn-around. A modifier is a set of options that applies to menu items. Use them to make sure your orders come in quickly and correctly, and your employees can enter custom ones for specific customer needs. Create a more memorable and organized experience with automatically generated customer profiles and a powerful reservation system. The interface is customizable from your iPad to match your restaurant's layout, keeping your staff more coordinated. We have the complete Apple iOS Solution - Apple iPad and iTouch Hardware, Credit Card Swipes, Remote Kitchen Printers, Thermal Receipt Printers, Cash Drawers and Wireless Network Ports and Accessories to make your Apple iPad Point-of-Sale solution a Full Solution. When you purchase your Apple iPad Point of Sale solution from us, you get the best of both worlds in Point of Sale support, service and hardware. p.s. Our cost is less!